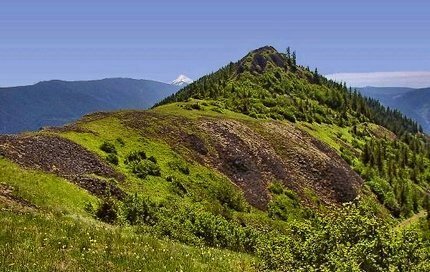 An outstanding hike with all the right features such as water falls, steep cliffy areas, superb views, ridge line hiking, and deep forested areas, complete with a loop for minimal repeat scenery. When Beacon Rock State Park is open, you drive to the picnic area and park at the Hamilton Mountain trail head. When the park is closed, leave your car along side the road by Beacon Rock. The hike begins moderately steep for about a mile then becomes more gentle as you approach the first of two falls. Hardy Falls is visible by taking a short side trip, but Rodney Falls is fully visible as your cross Hardy Creek on a bridge right at the foot of the falls. At this point the trail becomes much steeper and for the next 2 plus miles you gain nearly 1800' in elevation. About 2.5 miles into the hike you come to a junction where the trail returns via a loop from the back side of Hamilton Mountain. If you continue straight ahead, you will come to the base of the Little Hamilton Mountain. The works its way around to the west side of the slope and begins a very vigorous climb through a series of small switchbacks. At about 3 miles you level out on a little saddle between Little Hamilton and the main Hamilton Mountain. By now your are feasting on incredible vistas of the Columbia River Gorge and Beacon Rock. As you climb higher and higher, you will begin to see more of the mountains of Oregon to the south of you. Finally, you reach the top of Hamilton, and at the junction there, take the path to the right to a rest area with a view. 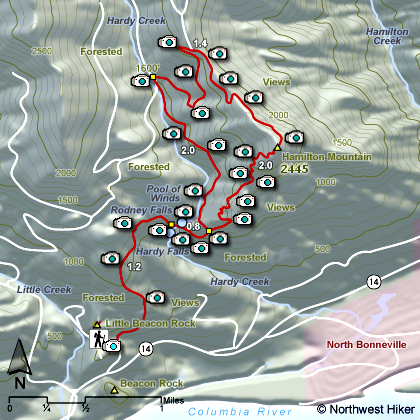 Return by walking the ridge line to the north for about a mile while continuing to enjoy extremely delightful views of Table Mountain to the northeast, and Mt Hood to the southeast. The trail eventually hooks up with a service road which you will follow for about a mile before entering back into the dense forested areas. This loop will conclude at the junction you saw on the way up the mountain at about the 2.5 mile mark. Beacon Rock State Park: Cross Bridge of the Gods in Cascade Locks ($2 toll). Turn left/west onto WA Hwy 14. Drive 6.5 miles west to the trailhead on the left side of the road. You'll see Beacon Rock getting bigger as you approach. As you come to the rest area facilities on your left, to your right there is a road that you will need to take to the parking area and trailhead for this hike. A Washington Discover Pass is required here. Alternatively, drive east on Highway 14. The trailhead is just west of milepost 35. Just before you come to the rest area facilities at the base of Beacon Rock, you will see a road off to your left. Follow this road to the parking area and trailhead for this hike. A Washington Discover Pass is required here.